Digby Betram Haseler fought in France in WW1. 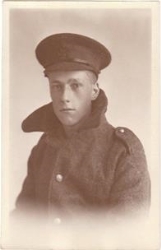 Whilst at School and during his time in the trenches he wrote poetry. These poems were publised to raise money for the Kings Shropshire Light Infantry during WW1 and later in anthologies by Cambridge University. Despite taking sharpnel to the head, Digby survived and after the War became a clergyman. In 2014, HCS Catabile Girls' Choir commissioned Michael Neaum to set one of Digby's peoms to music. In 2014, Digby's son Nick visited the school from Australia and was interviewed about his Father by Nicola Goodwin for BBC Hereford and Worcester Radio.